North Park University presents the 2012 JUSTICE SUMMIT. This conference brings together theologians, teachers, students, and activists from across the country. Participants at this two-day event will learn how to engage people in ministries of compassion and mercy, challenge policies through advocacy and community organizing, and partner with programs and projects of community-based organizations for the sake of Christ and his kingdom. 10:30 – Workshops, including presentations by Curtis Evans (U. of Chicago), Tim King and Lisa Sharon Harper (Sojourners), Corey Brooks (the rooftop pastor), Dan Hodge (NPU’s Director of Youth Studies), David Byrd (Chicago Urban League). NOON: Lunch forum/reception to learn about the NEW Urban Ministry Certificate Program (hosted by yours truly). It is not too LATE! Register at the door. Hope to see you there. Many years ago when I was pastoring a church in Cambridge, I was praying for a young Asian-American college student who came up to me after the Sunday worship service. He said that he was struggling with the concept of sin. He didn’t feel particularly sinful and was wondering what it meant for a person to be a sinner. This individual considered himself to be a pretty good person. In fact, his family, his friends, and the society around him had declared him to be a good person. He was a model student, a model son, and a model minority. He didn’t understand how he could be a sinner. Many years later, I was sitting with an African-American pastor friend. He had been a significant mentor to me in helping our church walk through issues related to urban youth ministry. He challenged my understanding of how to do altar calls. He contrasted the evangelical Christian (as well as my own) need and tendency to elicit a sense of sinfulness from the individual seeking conversion. He asserted that many African-American youth have already been told by society how wretched they are. They don’t need the church to tell them that they are sinful and that there’s something spiritually not right about them – they’ve been told that all their life. Your Asian-American Harvard undergrad is the one who really needs to hear that they might actually fall short of the glory of God. 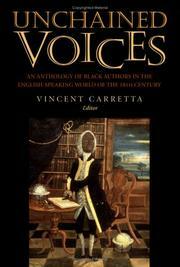 Unchained Voices is a collection of writings from black authors from the 18th century, edited by Vincent Carretta. It’s interesting to observe the repeated note of self-awareness about one’s sinfulness and “wretchedness” in the narratives offered by Carretta. For example, David George writes: “there was no possibility of relief, and that I must go to hell. I saw myself a mass of sin. I could not read, and had no scriptures. I did not think of Adam and Eve’s sin, but I was sin. I felt my own plague” (334-335). Equiano also reflects this perspective: “I felt that I was altogether unholy . . . I was still in nature’s darkness” (260). Conversion requires a sense of one’s own guilt, sinfulness, and wretchedness. I don’t have a problem with that doctrine, but it is interesting how circumstances, history, and context often determine how that doctrine is received, appropriated and applied. And herein is the reminder: “Amazing Grace, How sweet the sound that saved a wretch like me.” But why is it that some of us are made to feel more like a wretch than others? 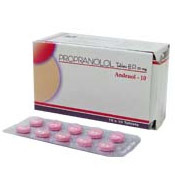 Many do not seem to get the main point of the research. The goal of the research is not to look for ways to spike everyone’s drinking water with a compound that would reduce racism in our world. If only that were possible. But the goal is to reveal a potential cause for racist attitudes. As the Telegraph article states explicitly: “Scientists believe the discovery can be explained by the fact that racism is fundamentally founded on fear.” Racists are driven by fear. Maybe that’s why the Bible so frequently says, “Fear NOT!” Doesn’t seem like a huge revelation, but it does put racism and racist attitudes in its proper context. Do not fear a black President. Do not fear the alien and immigrant among you. Do not fear the decline of white evangelicalism and the rise of non-white evangelicalism. Do not fear a black/brown world Christianity. Do not fear non-white thought leaders challenging the evangelical status quo. CHICAGO (February 2, 2012) – North Park University, Chicago, will host hundreds of people next month at an event for those who want to know more about justice as a way of life. Participants in the “North Park Justice Summit and Chicago Reload,” event will learn how to engage in ministries of compassion and mercy, confront policies through advocacy and community organizing, and partner with programs and projects of community-based organizations, all from a Christian perspective. 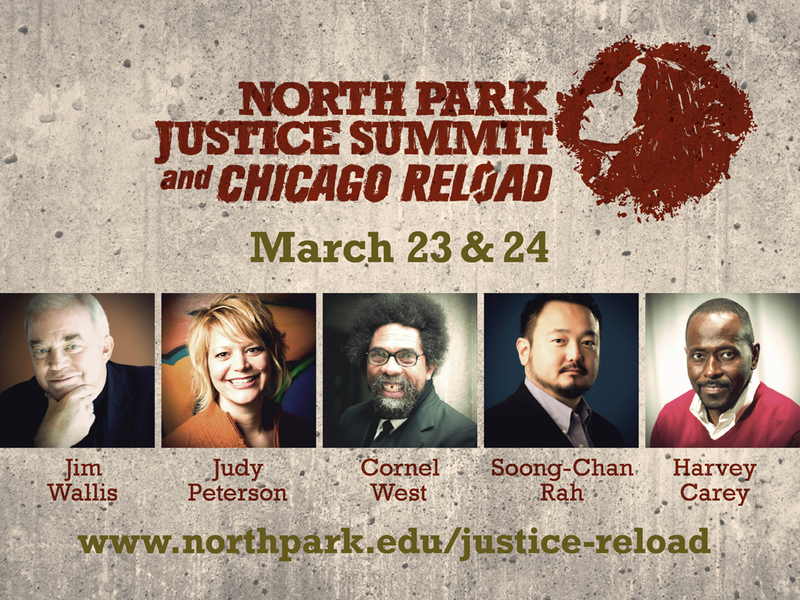 The Justice Summit and Chicago Reload is March 23-24. It combines Chicago Reload, an annual event for urban youth workers hosted by the University the past seven years, with a new Justice Summit to expand the audience and dig deeper into the subject of justice, including focus on systemic issues and policies. Event organizers are hoping at least 500 or more people will attend. Prominent plenary speakers highlight the event, and are expected to address justice, compassion and mercy from varied perspectives and contexts. They are Dr. Cornel West, Princeton (N.J.) University; Rev. Jim Wallis, Sojourners, Washington; Rev. Harvey Carey, senior pastor, Citadel of Faith Covenant Church, Detroit; Dr. Soong-Chan Rah, North Park Theological Seminary; and Rev. Judy Peterson, campus pastor, North Park University. “The whole idea is to gather folks around the issue of justice, and start the dialogue in a direction we think is holistic,” said Tony Zamblé, director, North Park University Ministries. “This idea gained traction because we believe North Park is uniquely positioned as an institution to lead the conversation on justice.” Justice Summit and Chicago Reload presenters will address the theological framework for justice ministry so participants understand what God calls them to do, and why, Zamblé said. Justice issues are a significant component of youth ministry regardless of the context, said Alison Burkhardt, assistant director, Center for Youth Ministry Studies, North Park University. “There is a real electricity around Chicago Reload, and I believe it’s going to translate into the full conference. I’m hoping attendees will leave knowing that what they do makes a difference, having perhaps a different perspective on the impact they have on the communities they’re working with,” she said. Conference planners hope attendees gain “foundations and tools” for doing ministry that can be applied in multiple contexts, Burkhardt added. Attendees will be able to choose from a significant number of workshops organized into four tracks, said Rich Kohng, urban outreach coordinator, North Park University Ministries. Workshop categories include “Presence,” “Policy,” “Programs,” and “Perceptions,” he said. Some workshops are already planned, and others will be added in the coming weeks. Kohng said he hopes attendees will become “contemplative activists,” combining their relationships with Jesus Christ and activism as important components of the gospel. Conference registration is open online; early registration rates are available through Feb. 29. Regular registration begins March 1 and closes online March 21. For those who sign up, conference email updates are also available. Justice Summit and Chicago Reload sponsors are three University entities: University Ministries, Campus Theme Committee, and the Center for Youth Ministry Studies. North Park University is affiliated with the Evangelical Covenant Church. I have had the pleasure of participating in several meetings and conversations in preparation for what promises to be a historic gathering in Cape Town this coming October. 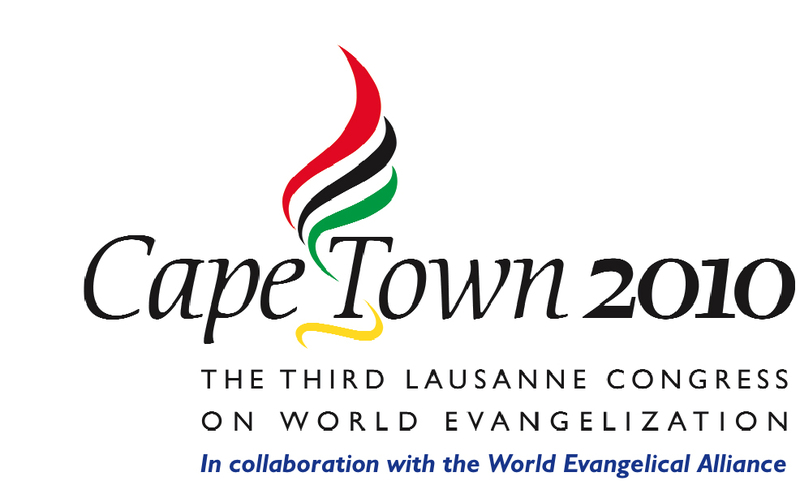 There is a growing sense of God’s great work for the past one hundred years and Cape Town 2010 will be a part of embracing God’s ongoing work of global evangelization. In the last century, the locus and demographic center of Christianity has shifted from North America and Europe to Asia, Africa, and Latin America. My concern, however, is that as the American delegation, we may be too quick to speak and to pontificate and too slow to hear and to learn. I raise these concerns as I have observed what seems to be a disturbing pattern in the conversations and gatherings that I have attended in the U.S. In my first such event, the gathered American pastors had the privilege of hearing from a South American evangelist, who laid out the how a community of believers evangelized his neighborhood through a corporate effort. The evangelist revealed an understanding of a holistic gospel that did not limit its impact to the saving of individual souls. This deeply moving and provocative presentation was followed by a American majority culture male who proceeded to essentially undermine the statements made by the South American evangelist; including a comment to the effect: “But we know what the gospel is really about . . . don’t we?” I may have misheard, but I got the distinct impression that the American pastor felt the need to correct the South American evangelist. In another gathering, there was brisk conversation around the issue of the intersection between social justice and evangelism. The conversation yielded much fodder for further inquiry. The lively interaction was followed by another majority culture European American male, who proceeded to make his proclamation of what he believed should be emphasis of the upcoming gathering in Cape Town. In other words, he was given the final word; and whether he contradicted the group discussion or not, it served to reinforce that the real authority in the room was the majority culture individual. In one of the latest round of conversation, there was a wide range of opinions offered by the panelists. But once again, an American majority culture male was given the last word and proceeded to give a long monologue about the state of the church. I don’t fault the individuals who were willing to share their heart. But I worry about how in the conversations in the U.S. church, the dominant, authoritative, and final voice is given to the white male. An added element that yields further exasperation is that there has been a noticeable lack of diversity in the panelists, among the host churches and the audience that have gathered for these conversations. This lack of diversity reflects an ongoing significant blind spot for the American delegation. I know that there have been some notable effort to recruit minority delegates, but unfortunately the dominant group remains the dominant group for the U.S. delegation. If we go to South Africa (of all places), for a global evangelization conference with a small number of Native American and African-American delegates, we should be justifiably embarrassed. Tokenism allows for one or two individuals of differing shades and hues to sit at the table. But tokenism also means that those voices are drowned out or corrected by the majority culture. At the end of the day, are we saying to the Christians outside of America, that it’s nice that you are here (in Cape Town or in a major U.S. city) and it’s nice that you have a few nice things to say, but we will still be sure to correct you at the end of the conversation to clue you in as to what’s really going on. I will readily admit that my experience reflects a very limited sample size. But I’m trying to grasp the big picture of what this gathering in Cape Town will be about. Everyone who goes to the Cape Town gathering will have the best of intentions and the noblest of motivations. I pray that as the delegation from the United States prepares to engage in conversation and dialogue with brothers and sisters in Christ all over the world, we would be slow to speak and quick to listen. Once in a while, legislation is introduced that makes the moral choice so crystal clear that it is nearly impossible not to do the right thing. The DREAM Act is one such bill. Every year, more than 65,000 students graduate from high school and discover they have no hope for the future. Without citizenship or legal status, they cannot apply for a driver’s license, struggle to find a college to accept them, and cannot legally work in the United States. Their crime? Being carried into our country as children without the proper documentation, often without any say in the matter or understanding of how it would affect the rest of their lives. Are we a nation that will continue to punish children for the actions of their parents? The DREAM Act says no! Ask the Senate to pass this important bill. The DREAM Act would provide a path to citizenship for immigrant students who have grown up in the U.S., if they attend college or serve in the U.S. military. It has strict criteria and caps on who is eligible, and would provide almost a million young people a chance to come out of the shadows and live a full life in the only nation they call home. The Senate plans to vote on the DREAM Act next week, as an amendment to a larger, previously scheduled defense bill. The media is already creating a story of conflict — saying the bill provides “amnesty” and shouldn’t be attached to a military bill. What are our priorities as a nation? We can spend billions on going to war and on our military, but will we come together to give almost a million young people a chance at a brighter and more promising future? 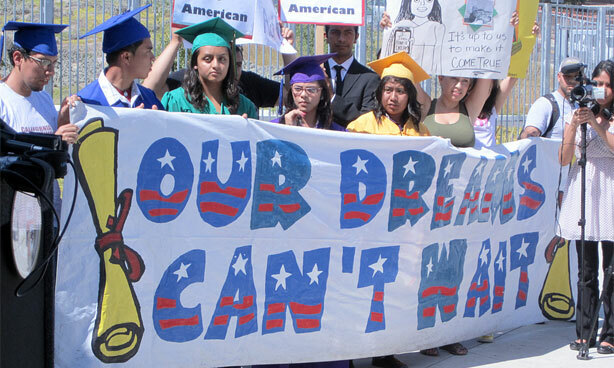 Tell the Senate to set politics aside and pass the DREAM Act next week! As people of faith, we believe that there is a clear biblical responsibility to show compassion for the strangers among us and to treat our neighbors as we would like to be treated. Sojourners’ Christians for Comprehensive Immigration Reform campaign has been a passionate voice for comprehensive reform to our immigration system. Passing the DREAM act is a step in the right direction on the journey for justice. An Update based upon some of the best shows of the ’90s. Law and Order (Tom Skinner’s Urbana ’70 Address). I’m working on some reflections on the emergence of Black evangelicalism in the later half of the 20th century. An excerpt from one of the most important addresses given by an African-American evangelical in an evangelical gathering. But how do you explain “law and order” to a mother who stands at the foot of her bed watching her baby lie in a blood bath, when she knows that that baby would never have been bitten by the rat in the first place, and the rat would have never been in the building, if the landlord to whom she had been paying high rent had been providing the kind of service she deserved for the kind of rent she was paying? How do you explain law and order to her when she knows the building code inspector, who represents the city administration, who is supposed to check out violations in buildings, came by that building the day before but was met at the front door by the landlord who palmed a hundred dollars in his hand, and the building code inspector kept going? Now that is lawlessness. Friends: It was great to see some friends when I returned to Boston to preach at Eastern Nazarene College’s Spring Revival. I’m back in Boston on two different occasions in the spring. Hope to catch up with others during those visits. I’ll be speaking at the Ethnic America Conference (in April) as well as Gordon-Conwell Center for Urban Ministerial Education (CUME)’s Graduation Banquet. We’ll also be swinging by Boston during the summer as I’m scheduled to speak at a family camp in New Hampshire in July.